The Inn at Union Pier is Harbor Country Michigan's premier lodging establishment with a reputation for fine service, comfort and privacy in casually elegant surroundings. Harbor Country is located just 75 minutes from Chicago and offers an abundance of unique shopping, dining, antiquing, and gallery hopping. Boutique wineries and "U-Pick" fruit orchards are just a short drive into the country. Year round outdoor activities range from torchlit cross-country skiing, to fall color bike touring, golfing an exclusive and challenging "private" course, or walking the endless beaches and hiking the soaring dunes. Just 200 steps from the beach, The Bed and Breakfast caters to both weekend getaways and weekday corporate retreats. Choose from 16 spacious guest rooms decorated in a mix of Scandinavian Country and Lakeside Cottage styles. All rooms offer private baths, and most feature antique Swedish wood-burning fireplaces and porches or balconies overlooking the landscaped grounds. Originally built as a summer resort in the 1920's, and totally refurbished in the early 1980's, guests may now unwind in the outdoor hot tub and sauna, play croquet or bocce ball on the lawn or take a bike out for a spin on a quiet country road. Every evening relax and enjoy Michigan wines and popcorn served in the Great Room. A bountiful breakfast and afternoon refreshments are included. 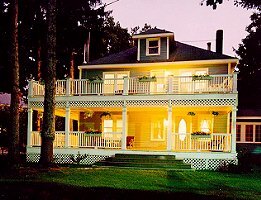 The Inn at Union Pier Bed & Breakfast hosts corporate retreats in a productive environment. Business meeting amenities include: guest room phones, fax, copier, 46" television with VCR, A\V equipment and conference space to accommodate 36 comfortably. Call for corporate rates. Rates: $155 - $230 with midweek discounts available. - 2 night min. on weekends, 3 nights on holidays. No Smoking - No Pets - Children over 12 welcome.